We started our trip New Zealand on South Island with some friends in Christchurch. They gave us a tour of the city, pointing out some of the scars that were still present after the 2010 and 2011 earthquakes. In particular, the city’s cathedral still lay in ruins with years of court cases still to decide its exact fate. I kept trying to work out whether a church would ever take out insurance to cover “Acts of God”. Anyway, we didn’t have long to contemplate such things as we picked up our camper van to explore what the South Island had to offer. Despite our van being the size of a small aircraft carrier it was pretty easy to drive on the New Zealand roads. There is not much traffic in the countryside and there are plenty of passing spaces for people to overtake your “white maggot” as the locals affectionately call tourist camper vans! We drove south and our first overnight stop was at Lake Tekapo. This lake was simply stunning. It is a bright turquoise colour set within a stunning mountain range. We parked the camper van next to the lake with a fantastic view from our window. In the morning we went paddle boarding on the lake without a care in the world. Despite the cold mountain water our daughter decided to jump from my wife’s paddleboard and swim to mine a few feet away. At 3 years old she had only really been used to warm baths and swimming pools and so I don’t think she quite knew what she was getting herself in when she leapt into the bracing mountain water! After Tekapo, we drove down past Mount Cook and on to Wanaka. Lake Wanaka reminded me of a loch in Scotland surrounded by mountains and gorse bushes. While in Wanaka we couldn’t resist a trip to “Puzzling World”. I suppose in the olden days they would call this a museum of “curiosities” with puzzles to solve and various illusions. Then at the end, there is an almighty maze to try and escape from. I would have probably been trapped for days had my wife not introduced me to this trick whereby you just make sure that your left-hand touches a wall on the left as you walk. I think the theory goes that you will end up exploring every avenue in the maze without ever going back down a route you have been down before. I didn’t believe it but somehow it worked! We got back into the “white maggot” and drove down to Queenstown through the Crown Range Road. I was quite surprised as to how dramatic the mountains, ridges, valleys, crevasses and winding roads were. So dramatic that it was only afterwards when I spotted on the map that the campervan company had given me it had the words “Under no circumstances are you to take camper vans on the Crown Range Road”. Oops! 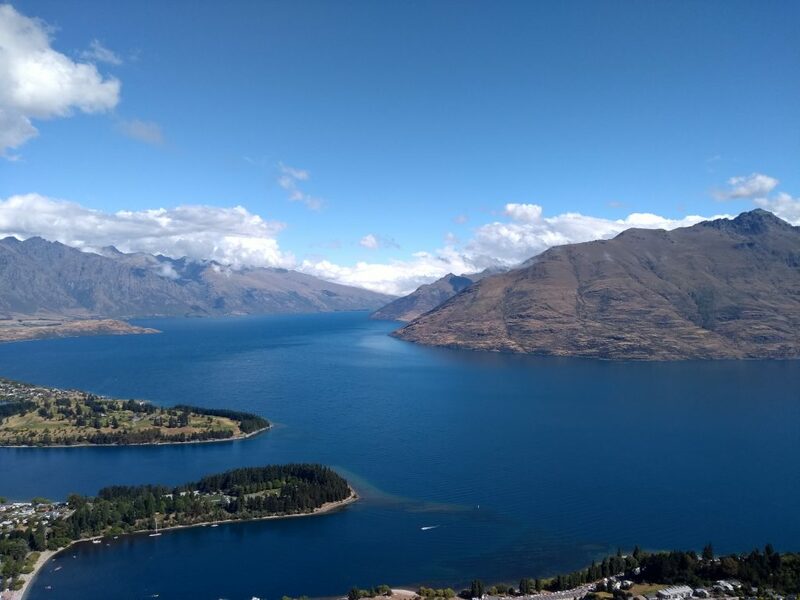 We were in Queenstown for Christmas Day and it was when I was there that I realised people in New Zealand didn’t really have the same turkey roast that we have in the UK on Christmas Day. The best I could find was turkey mince which I made into burgers and put under the grill. And so it wasn’t exactly a Christmas lunch with all the trimmings! Later that day we took the gondola up to the Skyline complex which overlooks Queenstown. 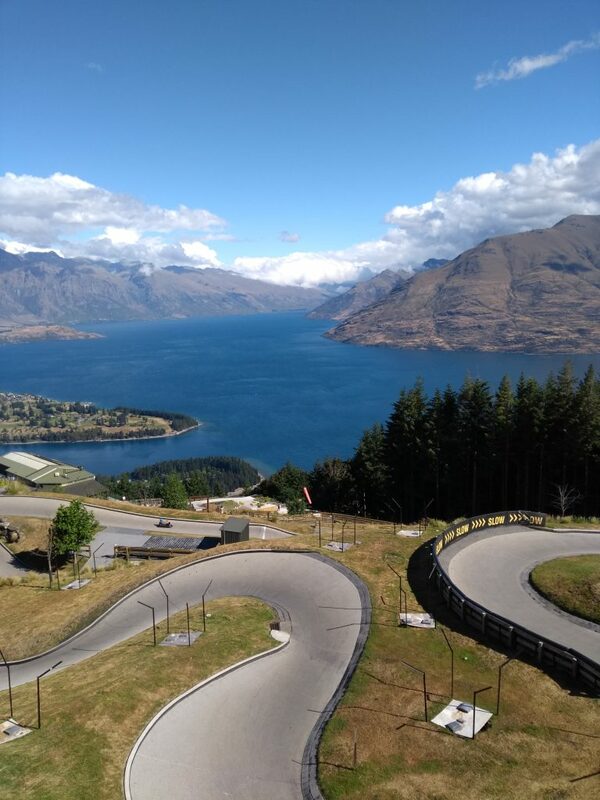 Not only were the views over Lake Wakatipu sensational but they also had a toboggan ride where you can throw yourself down a concrete track on the side of the mountain on nothing more than a sophisticated tea tray. Great fun! The next day we went in a light aircraft over the mountains to Milford Sound. This has to be one of the most incredible journeys on earth. 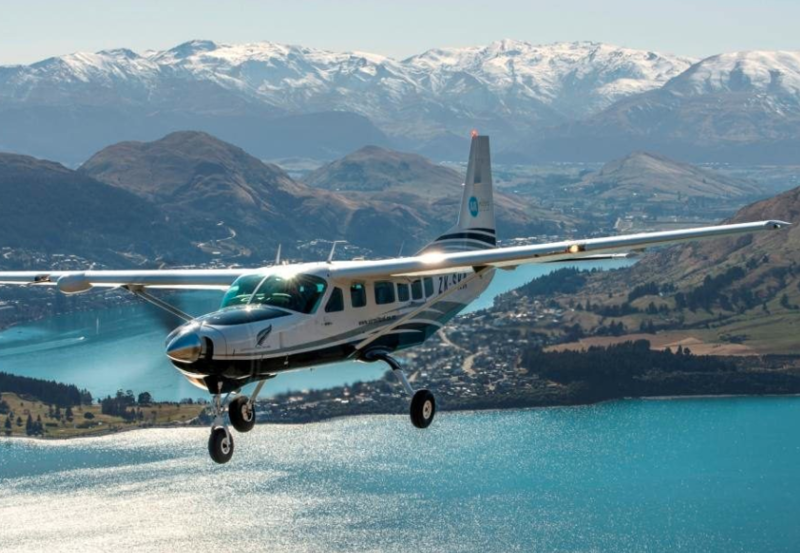 You are flying in a light aircraft ducking in and out of the mountains, above lakes and rivers and eventually landing on a tiny landing strip sandwiched between giant mountains. After landing we took a boat trip on one of the many ships that go up and down the fjords. 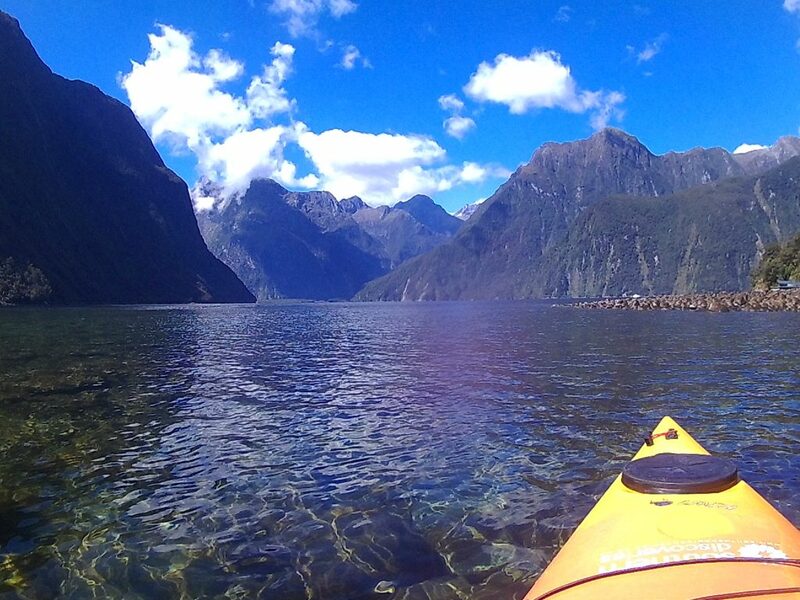 I then went on a kayak trip amongst the fjords and coves. It was utterly stunning. To top it off we visited an information centre that had a huge glass tunnel that went down to the bottom of the fjord and which allowed viewing of all the fantastic fish and underwater wildlife that lives in this incredible environment. We finished our visit to Queenstown with an adrenalin-fuelled, white water rapid ride down the Shotover river on a jet boat. This was an incredible ride as the boat uses an impeller rather than a propeller which means not only can it reach great speeds but it can operate in water as shallow as 10cm. This means you can get within centimetres of the shore, rocks and cliff edges….. all at about 60mph! After Queenstown, we drove across South Island to Dunedin. Founded by the Scottish and modelled on Edinburgh I spoke to someone from Scotland who said that they knew their way around Dunedin without ever having visited it before! We visited the Settlers Museum and Chinese Gardens which were great, but the highlight had to be the Taieri Gorge Railway journey to Pukerangi. You board a train carriage that looks like it’s been transported from the Wild West. As the train passes through gorges and over suspension bridges I felt like I needed to look out for cowboys and passing mule trains. When leaving Dunedin we visited the world’s steepest street, Baldwin Street. With a maximum gradient of 1 in 3, I am not sure why I agreed to walk up there. To make matters worse my three-year-old daughter announced halfway up that she wanted to be carried. We conquered it though and then paid for a completely unofficial certificate from some enterprising resident at the bottom of the road. We stopped overnight at Timaru which is famous for hosting colonies of Blue Penguins which are the smallest breed of penguin in the world. They come ashore at night to roost in the rocks by the beach. We managed to catch a glimpse of a few as they settled down for the night and managed to hear them slightly less settled in the morning! 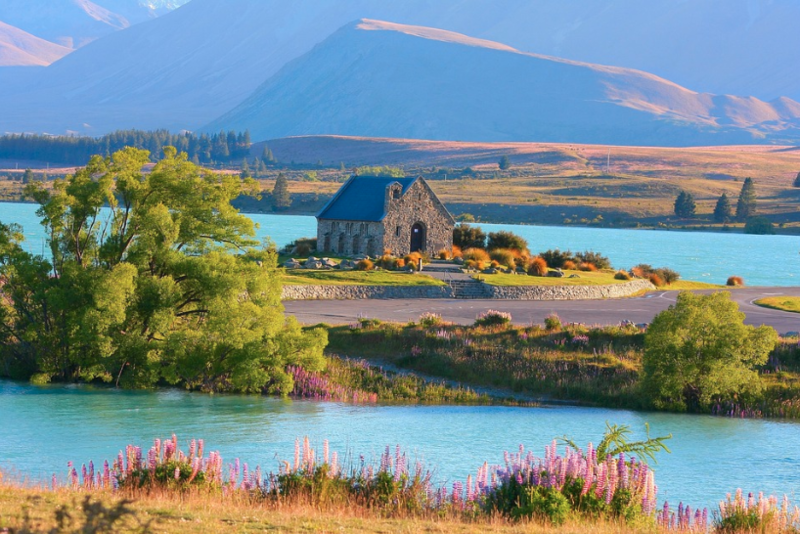 Have we convinced you that New Zealand is one of the greatest holiday destinations on earth? Place an enquiry on our website and let us find you the ideal route!